So, my little sister got married last weekend and guess who was in charge of making the wedding cake? Yep - yours truly! She requested a carrot cake and really, I would just go with my very favorite, and seriously amazing, carrot cake recipe, but there's just one tiny problem. It has pecans on top, and they really just seem to make the cake. It's just not the same without the nuts! I didn't think my sister would really be happy with the idea of having chopped nuts all over her wedding cake, so I had to come up with something different. Instead of putting the nuts on top, I included them in a coconut cream cheese filling. I also gave the cake a bit of a coconut boost by substituting coconut oil for the vegetable oil in the original recipe. This lessens the carrot flavor a little bit, but makes a nice blend of the carrot and coconut instead. I absolutely love the cake with this filling! 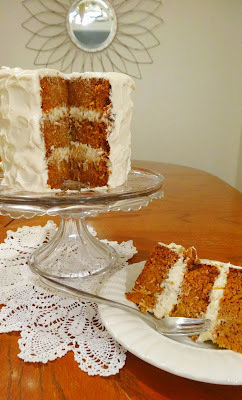 I've been in love with my carrot cake recipe for a long time and wasn't looking to improve it, but I think that I'm going to have to start making it with this filling from now on! This recipe makes about 6 cups of batter. I used it for a 6-inch 3-layer cake. You can also make a 9-inch 2-layer cake. For a more intense coconut flavor, try using coconut oil and coconut extract. Preheat oven to 350. Grease three 6-inch cake pans and line the bottom with waxed/parchment paper. Grease the paper as well. Whisk flour, baking soda, salt, cinnamon, nutmeg, and ginger in medium bowl to blend. (*Note: if using coconut oil, gently heat until almost melted, stir, and let cool a little bit. You don't want it so hot that it melts all of the sugar.) In a separate bowl, mix oil and sugar until well blended. Add the eggs one at a time and mix until well combined. Add the coconut extract now if you're using it. Mix in the dry ingredients. Stir in carrots and coconut. Divide batter between pans - about 2 cups in each. Bake layers for 45 minutes each, or until a tester comes out clean. Cool cakes in pans 15 minutes. Turn out onto racks, peel off paper and cool cakes completely. Frost cake using the Cream Cheese Filling between each layer, and Cream Cheese Frosting on top/around the sides. (*I didn't quite use all of the filling on the cake. If you have leftovers too, use it up in between graham crackers, or maybe just with a spoon!) 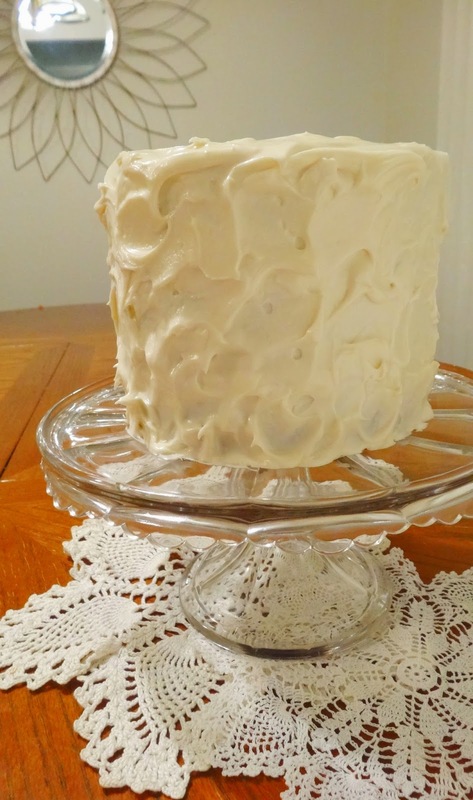 Be sure to do a thin crumb coat of frost on the outside and let it set before frosting the cake completely. That way you won't end up with cake crumbs throughout your frosting! Cream together the cream cheese and butter. Mix in the vanilla and powdered sugar until well combined.